Celebrating 11 years in business this November, the five star g Hotel & Spa has launched a special offer from €99.00 per person sharing in a junior suite from now until April 2017. 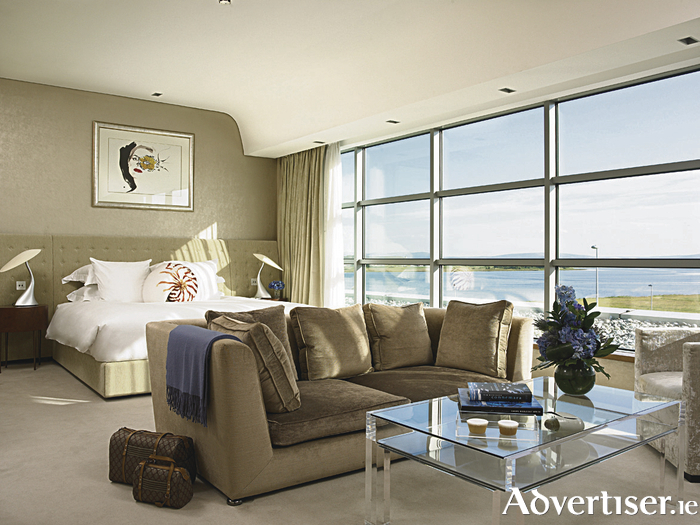 Treat yourself to a break in a luxurious 50sqm junior suite with sweeping views of Lough Atalia and the Galway city skyline. Join in the celebrations with a bottle of pink prosecco in your suite on arrival and luxuriate in the standalone Villeroy and Boch bath at the centre of the spacious bathroom. Following a night in the heavenly super king bed, start your day with a sumptuous full Irish breakfast in Restaurant gigi’s – winner of the Best Hotel Restaurant in Galway at the 2016 Irish Restaurant Awards. During your stay at the award winning g Hotel & Spa, you will have the opportunity to relax in the Philip Treacy designed Signature Lounges perfect for afternoon tea or pre-dinner cocktails created by the expert mixologists. Dine in the city or stay and savour a delicious dinner at Restaurant gigi’s inspired by the local landscape and seasonal produce. Head chef Jason O’Neill and his team create gastronomic treats each day and it is easy to see why Restaurant gigi’s has been awarded two AA culinary rosettes. Once you have supped and sipped your fill, the 20,000sqm luxury spa ‘ESPA at the g’ is the ideal choice to revitalise the mind and rejuvenate the body. Located in the heart of the g Hotel, it is the only five star destination spa in Galway city. ESPA at the g offers a wide range of treatments from its Signature Chakra Balancing with hot stones to skin radiance facials and deep muscle massages. All treatments of 55 minutes or more include an hour's thermal suite therapy as part of the spa journey with ESPA and post treatment ‘me-time’ in the naturally lit zen Relaxation Lounge. To book the fabulous 11th Birthday offer from €99pps at the g Hotel & Spa visit the website www.theghotel.ie or call 091 865200. Terms and conditions apply and offer is subject to availability of the junior suite room category at the time of reservation. Rate quoted is valid Sunday to Thursday and a supplement will apply to Friday and Saturday reservations.